Postoperative pain is common in patients at a maxillofacial surgery ward. Therefore, postoperative pain management turns out to be a great challenge for the medical staff . We examined the effectiveness of the institutionally established pain management at a maxillofacial surgery ward via a patient survey during their hospitalization. This study was designed as an open, observational, prospective trial. 18 male and 17 female patients older than 18 years were included. After obtaining informed consent, patients were asked to complete a specially designed questionnaire before their hospital discharge. Rest pain and maximum pain (highest pain within the last 24h) were self-accessed by patients using the 11-point numeric rating scale (NRS). Descriptive statistics were performed by CERTKOM e.V. and used to present the obtained data. Data are visualized using a star-qua representing 5 benchmarks: (I) "Pain control" summarizes stress pain, rest pain and maximum pain. (II) "Therapy effect" shows the efficiency of the medication. (III) "Therapy process" summarizes the application of analgesic, additional medication at heavy pain and the response time. (IV) "Information" for the patient's knowledge about his pain status and the countermeasures. (V) "Self-initiative" for the patient informing the medical staff. All 35 included patients (100%) received preoperatively an analgesic. Thereby, 3 patients (8.6%) were without pain at any time, but 32 patients (91.4%) still suffered from pain. the rest pain was higher than the well accepted limit of NRS 3 in 10 patients (28.6%). Looking at maximum pain, 11 patients (31.4%) even exceeded the significantly higher limit of NRS 6. 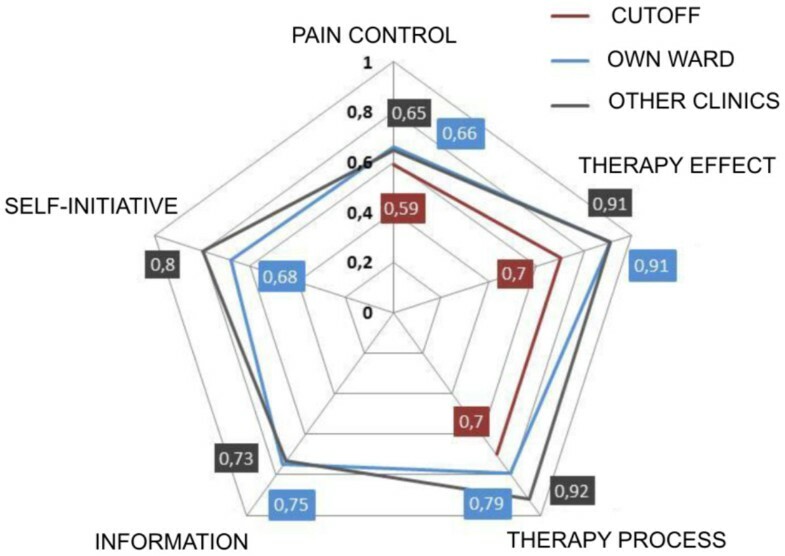 The overall quality of the pain management was measured with five benchmarks, as presented at Figure 1. Star-qua plot representing the results of the 5 key parameters pain control, therapy effect, therapy process, information and self-initiative in postoperative maxillofacial surgery patients. Postoperative pain management is well established at our maxillofacial surgery ward. Our collected survey data well agree with published data from other clinics. However, about one third of the patients still suffer from unacceptable high rest pain or maximum pain. Further improvements to reduce this for the patient unacceptable pain status are mandatory and already initiated.